Pinot Blanc and Pinot Bianco are two names for the same grape, but they produce markedly different wines. Blanc refers to grapes grown in France, and Bianco comes from Italy. The French versions, from Alsace, are musky and creamy-textured; those from Italy have zippier acidity, with pear or even soft citrus flavors. 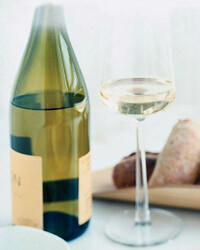 American Pinot Blancs are usually made in the French style, as the name suggests. Pour Pinot Blancs with cheese-based dishes; Pinot Biancos go nicely with light foods like chicken breasts or flaky white fish in a simple sauce.